- Natural Energy sources - include the food we eat, water, sunshine, herbs/essential oils, natural sounds, other people, the air we breathe, and from God Himself - our ultimate source of energy! - Man-made sources - include electromedicine or other mechanisms providing energy at frequencies mimicking nature. E.g. light or sound therapy, frequency therapies. Note also, that man-made energy sources not “in tune” with nature can reduce cellular energy production. A human generates ~100 Watts on a 2000 calorie daily diet, about the same as a bright light bulb. 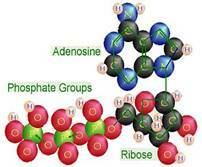 (2) ATP releases energy when broken down by enzymes. When you move a muscle, think, breathe, replicate your DNA, and when your heart beats, you use ATP molecules. Cells produce ATP most efficiently by a complex process called “cellular respiration” utilizing OXYGEN and glucose. This enzyme-controlled process takes place mainly in the cell's MITOCHONDRIA (200-300 of these “energy factories” in a cell), in which OXYGEN strips high-energy ELECTRONS from (“oxidizes”) organic compounds, such as glucose and fatty acids. Interesting factoid: mitochondria have their own DNA, but it is circular, not helical like cell DNA. They reproduce like bacteria, replicating their own DNA and directing their own division. These ELECTRONS are then passed to successive steps in the Cellular Respiration Cycle to ultimately produce cellular ATP energy. Active cells, such as muscle cells require more energy and therefore contain more mitochondria. When no glucose is available, ATP can be produced from ELECTRONS stored in FATTY ACIDS, and the liver can also convert protein AMINO ACIDS to glucose. Cells can also produce energy without oxygen. But by much less efficient fermentation pathways.